A note about this recipe: I was born in Kentucky where Bourbon whiskey is highly thought of as a substitute for Vanilla Extract and that’s what I use here. If you plan on using Bourbon, remember that it must be STRAIGHT Bourbon, not blended whiskey. However, if you prefer using Vanilla Extract, by all means do so. Stir cinnamon and sugar together in a separate bowl, and pour into Corn syrup mixture. This step keeps the Cinnamon from lumping. 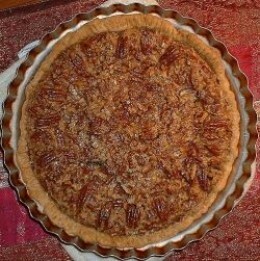 Stir in pecans and pour into unbaked pie shell and bake for 60 to 65 minutes. If pie edges are browning too quickly cover edges with foil or use a pie shield. Remove foil or pie shield 15 minutes before pie is done to allow edges to brown. To test for doneness, tap center of pie lightly. If it springs back, it’s done. Cool for at least two hours before cutting. Photo Credit: This image is in the public domain because it contains materials that originally came from the Agricultural Research Service, the research agency of the United States Department of Agriculture. According to Wikipedia, the pecan is a member of the hickory genus, but is technically a drupe, a fruit with a single stone or pit, surrounded by a husk. Pecan pie of course, makes great use of the rich flavor of pecans. They are also used in a candy in the southern states known as Pecan Pralines. At this time, the leading pecan producing state is Georgia, followed by Texas, New Mexico and Oklahoma. Pecans have unsaturated fats and are a good protein source. Like walnuts, pecans are high in omega-6 fatty acids. Anti-oxidants and plant sterols found in pecans also reduce high cholesterol. So isn’t it nice to know that while you’re eating that sinfully delicious pecan pie, you’re at least getting something good for you? I receive them quickly with suggestions from the grower to put them into the refrigerator or freezer until ready to use. But this is where my problem begins; the temptation is to munch just a handful, but if I do, I’ll be lost! If I want them for pies, I need to battle the urge to take just a few…and a few more…and a few more…and before I know it, I have no pecans for pie. Once I get them into the freezer, it becomes easier since I don’t go into the freezer frequently. But woe is me, if I just refrigerate them, because I’ll have to make another order before I can make my pecan pies. Consider that a warning for those of you who, like me, can’t resist those big beautiful, fresh pecans. Oh Nancy Pecan pie is one of my all time favorites, pinning this one for sure. I love your site! !